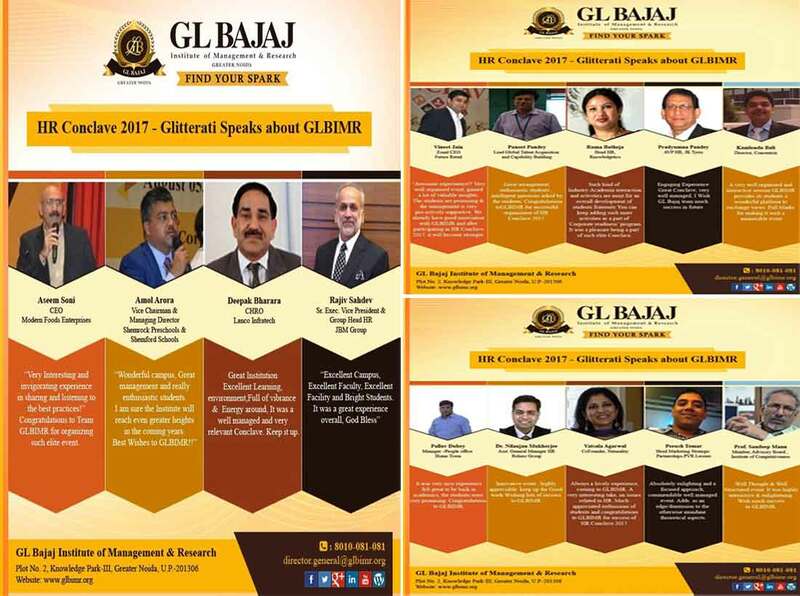 GLBIMR successfully organized "HR Conclave 2017 - Leveraging HR for creating Competitive Edge", on August 05, 2017, Saturday at its Greater Noida campus. The Conclave brought along the most efficient HR fraternity discussing about the concurrent concern areas in HR & People Management. This Conclave which was a huge success was attended by around 400 people from HR & Media Fraternity, Corporates, Academics, Students, Faculty & Staff members of GLBIMR. The Media Partners were Dialogue India and Business World and corporate sponsors were Nutriglow and Organic India. Here are glimpses of motivating comments/feedback shared by the elite speakers & panelists. We are thankful to all of you for sharing your valuable & highly motivating feedback.